If you have been diagnosed with liver metastases from breast cancer you are probably wondering what comes next. Or, instead, you may have had breast cancer in the past and be wondering if the symptoms you are having could be a sign of a metastasis. What should you know about the symptoms, the treatment options available, and the prognosis when breast cancer spreads to the liver? Liver metastases (the spread of cancer to the liver) occur in roughly half of people who have metastatic breast cancer. The liver is the second most common site of distant metastases from breast cancer (the most common is bones). Terminology can be confusing as well, and breast cancer metastatic to the liver may also be referred to as stage 4 breast cancer, or advanced breast cancer, or "secondary liver cancer." It can be helpful in describing the symptoms of liver metastases to briefly review the anatomy and function of the liver. The liver is located in the right upper quadrant of the abdomen, just under the diaphragm and is near many of the major abdominal organs (which it may press against as it enlarges from metastases). It is ordinarily present just under your ribs where you can't feel it, but when it becomes enlarged you may feel a mass (often hard) just below your rib cage on the right side. The liver is made up of lobes encased in a fibrous sheath. When the liver enlarges, it can cause stretching of this casing, which can be quite painful. Abdominal pain: Pain is often felt under the ribs in the upper right side of the abdomen. Shoulder pain: Compression of nerves which travel near the diaphragm by liver metastases may cause you to feel pain in your right shoulder. Nausea: Nausea may occur due to the presence of an enlarged liver pressing on other abdominal structures and from the build-up of toxins in the blood when the liver is not functioning normally. Hiccups: When the liver is enlarged and pushes against the diaphragm, it can cause hiccups. Itching (pruritis): The itching which goes along with liver metastases can be severe. The reason for the itching is bile acids which can build up in your skin. Some people with breast cancer find this to be one of the more annoying symptoms (and if your loved one is struggling with this she (or he) may ask for repeated back scratches). Ascites: Fluid build up in the abdomen due to improper functioning of the liver is referred to as ascites. Jaundice: A yellowish discoloration of the skin and the whites of the eyes, jaundice, may occur secondary to the build-up of bile acids in the skin. It usually occurs if there is extensive involvement of the liver or blockage of the bile duct by the tumor. Liver enlargement can sometimes appear as a mass in your abdomen. Bleeding: Lack of clotting factors due to malfunction of the liver can result in bleeding. Bleeding, in turn, can lead to anemia. The liver can often be largely replaced by tumor before significant symptoms occur (depending on the location of the metastases). The liver is capable of remarkable regeneration after the treatment of liver metastases (in contrast to some regions such as the brain). Liver metastases may be diagnosed in a number of different ways. Metastases may sometimes be found before any symptoms are present when scans are done for staging. They may also be suspected if blood work reveals abnormal liver functions tests. If symptoms are present there are a number of ways in which these can be detected, including abdominal CT, MRI, ultrasound, or a PET scan. Sometimes the upper portion of the liver can be found to have metastases on a chest CT as well. How Does Breast Cancer Spread to the Liver? The way in which breast cancer spreads to the liver is not understood as well as that of bone and lung metastases, but research is ongoing. It's hoped that a better understanding of the mechanisms behind liver metastases will help researchers design better treatments, and possibly ways to prevent liver metastases. What we are learning is that the "microenvironment" of the liver plays an important role in whether liver metastases occur. Therapies to help people cope with the symptoms of liver metastases such as ascites, pain, and itching. General treatments which are used to attack breast cancer cells anywhere in the body (systemic treatments). Receptor status needs to be reevaluated as estrogen receptor, progesterone receptor, and HER2/neu status can change (in other words, even if a tumor was initially estrogen receptor positive, it could now be estrogen receptor negative). Metastasis specific treatments, which address the areas of cancer in the liver specifically. These may be used to decrease the volume of metastases to reduce symptoms, or sometimes, when only a single or a few liver lesions are present, treatment may attempt to eradicate liver metastases altogether. Let's take at look at each of these types of treatments. In addition to treatments designed to address the cancer, treatment to control symptoms is very important. This may include treatments for itching. treatments (such as abdominal paracentesis, using a needle to withdraw fluid) to reduce discomfort due to ascites, and control of pain and nausea. It's also important to be aware of substances (such as medications) which can worsen liver function when metastases are present, and these are discussed below. An important first step for people with metastases, whether to the liver alone or elsewhere, is to recheck receptor status. Many people are surprised to learn that the receptor status of a breast cancer which recurs at a distant location can have different characteristics than the original breast cancer in the breast. For example, a tumor which is originally estrogen receptor positive could now be estrogen receptor negative, and a tumor which is originally HER2/neu positive could now be HER2/neu negative and vice versa. The initial general treatments designed for metastatic breast cancer depend on these characteristics of the tumor and may include chemotherapy, endocrine therapies, targeted therapies for metastatic HER2 positive breast cancer and other treatments. 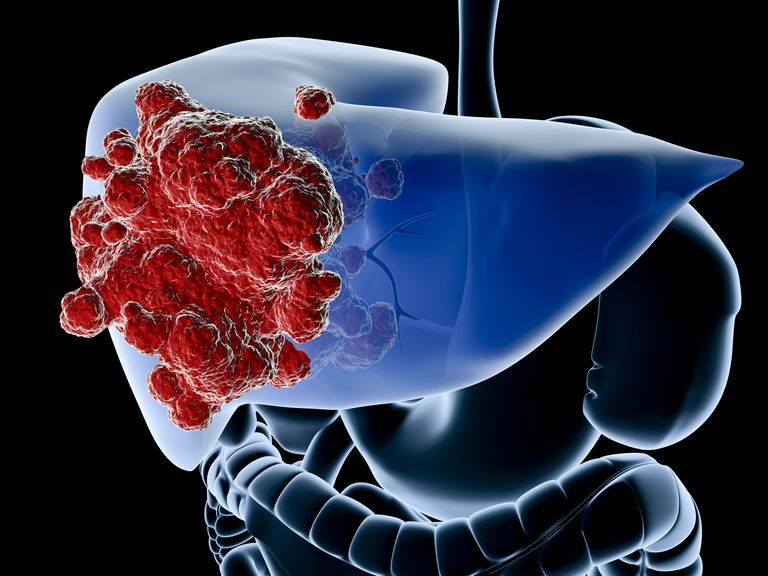 In addition to treatments designed for metastatic cancer in general, there are several options for treating the liver metastases specifically. The use of these therapies varies depending on many factors including the type of cancer, the presence of other sites of metastases, the number and size of metastases, and the location of these lesions. These treatments can be used in either a palliative fashion (especially since chemotherapy is not terribly effective against liver metastases) or in an attempt to achieve long-term survival. General treatment: Radiation therapy to the liver is used commonly as a palliative therapy, as it can often significantly reduce the size of liver metastases, and consequently symptoms. Surgery: Some metastatic tumors can be removed surgically via a procedure called a "metastasectomy." This treatment has resulted in long-term survival in carefully selected people. Embolization: Transarterial embolization therapy therapies may be used. These include transarterial embolization (TAE), chemoembolization, and radioembolization. These techniques may be effective for tumors which cannot be easily reached by surgery. Percutaneous image-guided tumor ablation (radiofrequency ablation, microwave energy ablation or cryoablation (freezing) may be used in some circumstances. Stereotactic body radiotherapy (SBRT): SBRT uses very high energy radiation delivered to a precise area of tissue in an attempt to completely destroy a small area of tissue (such as liver or brain metastases). Precautions you may need to take will depend on the degree of metastases you have to your liver. For some people, metastases are noted on a scan but liver function tests remain normal and there are no symptoms. On the other hand, some people have liver function tests which are very abnormal or significant symptoms related to a large tumor load in the liver. Alcohol intake: People with significant liver metastases are often advised to avoid alcohol. The reason for this is two-fold. If your liver is not functioning at full throttle, you will be unable to metabolize alcohol like you ordinarily would. This can lead to alcohol building up and persisting in your system. From a different standpoint, we know that alcohol can be toxic to liver cells, and adding this to cells which are already compromised could worsen any liver dysfunction which you have. Medications metabolized by the liver: Most medications are either metabolized (broken down) by the liver or the kidneys. There are often options for treatment including both medications metabolized by the liver and others metabolized by the kidneys. When this option is available, your doctor will likely recommend a treatment which is metabolized by the kidneys (as long as you do not have abnormalities in your kidney function as well). When a medication that is metabolized by the liver must be used (such as with many chemotherapy drugs), the dose may need to be altered based on the degree of liver dysfunction present. Over the counter and herbal preparations: It’s important to note that there are many over-the-counter and herbal preparations that are metabolized by the liver as well. An example includes over the counter pain relievers. Tylenol (acetaminophen) is metabolized in the liver (and should be avoided in people with liver dysfunction) whereas most non-steroidal anti-inflammatory agents like Advil (ibuprofen) are instead metabolized by the kidneys. It's important to note that not only may some over-the-counter preparations be a problem if you have liver metastases due to their metabolism, but some vitamin and mineral supplements may interfere with chemotherapy, as well. Metastases to the liver are very heterogeneous, and survival can vary significantly between different people. Life expectancy for breast cancer with liver metastases without treatment is only four to eight months, but most people seek treatment. With treatment, the 5-year survival rate for people with distant metastases related to breast cancer is 23 percent. On the other end of the spectrum, in carefully selected people with only liver metastases (oligometastatic disease) treated with chemotherapy plus resection (or ablation) of liver metastases, 5-year survival rates can be as high as 40 percent. Prognosis is worse for those who have a poor response to chemotherapy and for those with estrogen receptor-negative disease. While breast cancer which has spread to the liver is currently not curable, treatment options are available which not only reduce the symptoms but can significantly increase life expectancy with the disease. We currently know less about the mechanisms behind liver metastases than some other sites of metastases, yet this offers hope that newer and better treatments will be found both to treat and hopefully prevent liver metastases in the future. Learning that you have metastatic cancer can be a total shock. If you had early stage breast cancer in the past, you are now facing a disease which is not curable, and often requires some form of therapy for the rest of your life. Keep in mind that even with metastases, treatments are improving. As noted under the treatment options for liver metastases above, there are many different therapies that are being used and even more in clinical trials. There is also hope that research looking into the role of the microenvironment of cancer in the liver will offer further treatment approaches. It's important to learn about your cancer and to be your own advocate in your cancer care. Reach out to family and friends and allow them to help. Becoming involved in a support group or support community specifically for people with metastatic breast cancer can also be a tremendous help, not only in providing emotional support (being able to talk to someone who has "been there') but in having connections through which to learn about the latest research. Take a moment to learn about social media and breast cancer, as well as the Metastatic Breast Cancer Project. Studies tell us that becoming an active part of your medical team leads to less distress and may even make a difference in your outcome. It is frightening and shocking to learn you have metastatic cancer, but there is much hope, and both treatment and survival rates are improving every year. Criscitiello, C., Andre, F., Thompson, A. et al. Biopsy Confirmation of Metastatic Sites in Breast Cancer Patients: Clinical Impact and Future Perspectives. Breast Cancer Research. 2014. 16(2):205. Golse, N. Liver Metastases From Breast Cancer: What Role for Surgery? Indications and Results. Clinical Breast Cancer. 2017. DOI: org/10.1016/j.clbc.2016.12.012. Ma, R., Feng, Y., Shuang, L. et al. Mechanisms Involved in Breast Cancer Liver Metastasis. Journal of Translational Medicine. 2015. 13:64. Weinrich, <., Wieb, C., Schuld, J., and B. Rau. Liver Resections of Isolated Liver Metastasis in Breast Cancer: Results and Possible Prognostic Factors. HPB Surgery. 2014. ID 893829.